In this tutorial you will learn how to create a post form with the Form Wizard. Here you give your form a name. The name is only for the administration of the form and not visible to submitters of the form. Type in the form name, f. e. "Blog post". Here you define the post type which is created once a form is submitted. Choose a post-type from the drop-down menu. Depending on the features of your WordPress installation are you able to choose other post types, too. As we want to publish blog posts, we continue with "post" as the post type. Note: Some options are only manageable with our paid plans. Here you define what happens after a post form is submitted. Choose a page where you want to collect and publish your submissions. If the page does not exist yet, you can also create a new page by clicking on "Create a new Page". 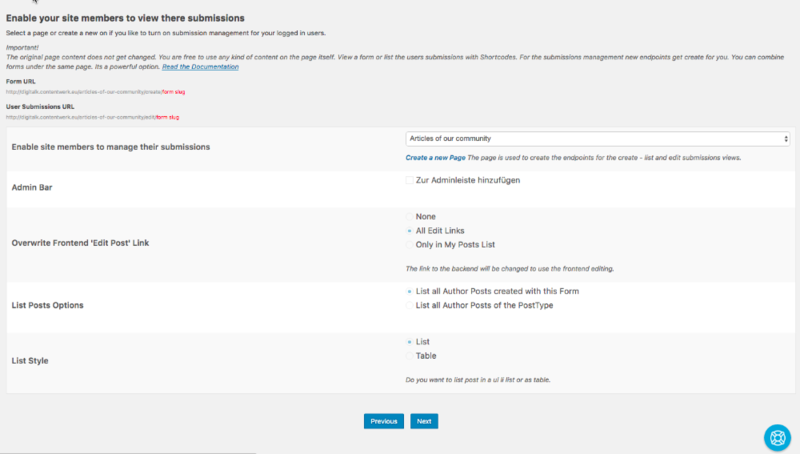 Once a page is selected, you get more options to manage your submissions. Note: This features are only manageable with our paid plans. Here you choose which form elements are added to your form. 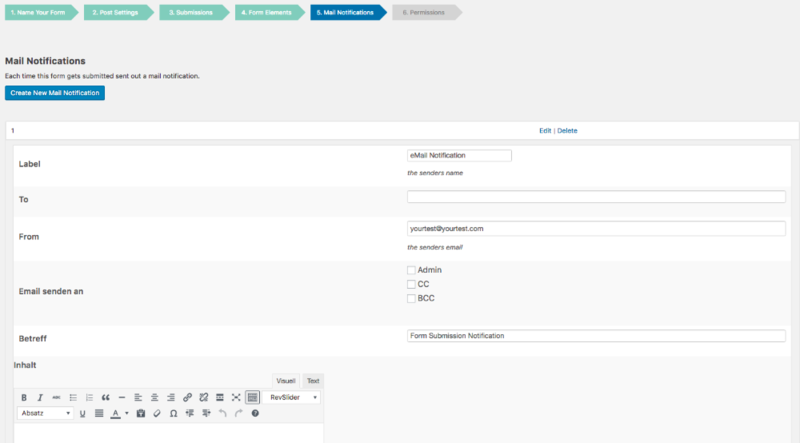 By default, we added 2 form fields to your post form: Title and Content. To add more field elements, select them from the drop-down menu and click "Add Field". For each field, fill out the tabs General, Validation and Advanced. Description: This is shown as an help text to the one who fills out the form. Benötigt: Select if the field is required or not. Validation Error Message: Type in your individual error message in the field "Validation Error Message", that appears when the user didn't fill in the required field. Validation Min/Max Length: In order to validate the submitted data, define how many characters are as a minimum and maximum needed in order to submit the form. Add as admin post meta box to the edit screen: Select this option if you want to see it as well in the "edit post view" when editing other posts. Add custom class to the form element: In order to style this field, type in a custom class to which you can refer in your CSS. 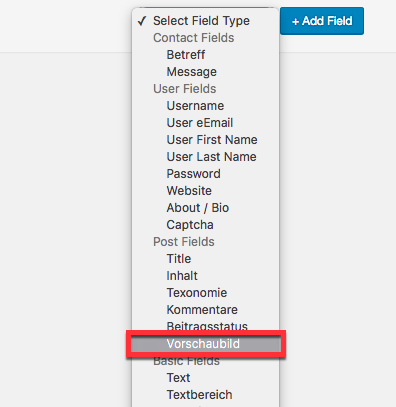 Hidden: Select this option if you wan to submit data via this field that should not be visible to the one who fills the form. Here you can set a mail notification to get a mail notification any time a user submits the form. Inhalt = Here you compose your individual message. You can use form and field slugs to enhance your notification message. Here you define who has access to the form and which users are allowed to change the submitted content. Public submittable: If selected, the form will be visible to all visitors of your website. If so, we recommend you to use the reCAPTCHA field element to prevent you from unnecessary SPAM. Enable Login on the form: If unregistered users should be able to submit content through the form, you can register them during the submission process. Define here, if the login form should be placed above or beneath the form. Create an account? : Select this field to create a user account during submission. Define here which user roles are allowed to change (create, edit and delete) the content that is submitted through this form. High Five! Your form is ready! Find here all the short codes that you can embed in any page or article you like to publish your form and/or the related objects. Click Copy + C to save it into your clipboard for further use. From the menu on the right sight, you can jump right into the preview of your new form, your submissions or back to the form itself. To continue: Read the instructions about Publishing the Form and learn how to embed it.